This ground floor apartment sleeps two and opens up onto a spacious patio which has a private swimming pool. The apartment is decorated with rich textures and warm earthy tones that compliment the modern aesthetics, while contemporary architecture maximises views of the Twelve Apostles mountain range. This 1st floor apartment sleeps two with sleek interiors and modern accents. The contemporary architecture maximises views of Lion’s Head. This 2nd floor Camps Bay Loft Apartment sleeps two and is designed with modern interiors and architecture that maximises views of Lion’s Head mountain. This Camps Bay Apartment sleeps six and with two private balconies to enjoy the exquisite views. Designed with modern interiors and architecture to accentuate views of the Atlantic Ocean, Lion’s Head mountain and the surrounding natural features. This Camps Bay Apartment sleeps six and its large windows maximise the exquisite views. Designed with modern interiors and architecture to accentuate views of the Atlantic Ocean, Lions Head Mountain and the surrounding natural features. This Camps Bay Studio Apartment sleeps two and opens up onto a private garden. Uber modern interiors and architecture maximises views of Lion’s Head mountain. This Camps Bay Apartment sleeps six and with a private balcony to enjoy the exquisite views. Designed with modern interiors and architecture to accentuate views of the Atlantic Ocean, Lion’s Head mountain and the surrounding natural features. This Camps Bay Apartment sleeps two and is designed with modern interiors and architecture that maximises views of Camps Bay and the ocean. Features include a fully equipped kitchen and private patio with views of the ocean. Intimate living space able to accommodate two people. Intimate living space able to accommodate two people. Features include a fully equipped kitchen and private patio with views of the ocean. Beach Studio Apartments and Rooms offer fresh and clean accommodation situated less than a minutes walk to Camps Bay Beachfront. Perfect for Couples, Kids, Families and Groups in Resort Style Accommodation with swimming pool, inclusive of breakfast. The apartment has street views and is located 150m from the Camps Bay beach, restaurants and cafes. 30m from the Camps Bay Beach, cafes and restaurants. Sea views from an enclosed balcony, with an open plan lounge, dining area and fully equipped kitchen. 30m from the Camps Bay Beach, cafes and restaurants. The apartment has an open plan lounge, dining area and fully equipped kitchen with enclosed balcony with sea views. Enjoy the sea and mountain views from the terrace, or on a hot summers day take a dip in the large pool located in the complex. This large and spacious one bed apartment is a true gem in Camps Bay. Conveniently located a two minute drive away from Camps Bay beach, shops and restaurants it radiates a French and rustic country feel throughout with classic and light interiors. Summer Place is a luxuriously furnished, spacious and beautifully finished three-bedroom town house which is superbly located in a terraced residential complex (6 town houses) a short walk from Camps Bay beach front and offers magnificent views of the the Twelve Apostles mountains and the ocean. The property is perfectly located (approximately 200 metres from the beach) within walking distance to the beach and the vibrant Promenade with street cafés, restaurants and night life. 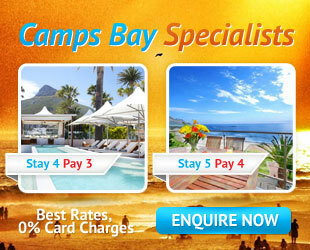 The apartment offers the advantage of being located within a stones throw from Camps Bay Beach. This Camps Bay Penthouse is close enough to the sea to scent brine upon the breeze, yet a screen of foliage affords a modicum of privacy and adds to the intimate ambience. The enclosed private balcony is accessible from the lounge and the single bedroom, and provides a peaceful place in which to relax and enjoy the amazingly beautiful sunsets without being troubled by so much as a random gust of wind. The balcony, accessible from the lounge, has an outside table at which to sip sundowners while admiring the Cape’s awe-inspiring sunsets and enjoying its seductively fresh, salty air with a meal. 1 Bedroom, 1 Bathroom (9 Apartments) Sleeps 2Each apartment offers breathtaking ocean views, with a private balcony plus a table and chairs. The furnished wooden deck with its gas barbeque invites you out into the fresh sea air where you may bare witness to that perfect Postcard view of Camps Bay Beach. The elegantly styled lounge of this three-storey luxury villa opens onto a spacious balcony equipped with sun loungers on which to relax and work on a good tan. 7th Heaven has the advantage of a secure townhouse complex, with two swimming pools and protected parking, while at the same time providing a private and quiet getaway. The large, open plan living and dining area flows onto the deck with exquisite sea views. The ultimate one bedroom accommodation in Camps Bay, the Suite Apartment offers the perfect retreat for a couple looking for some privacy with fantastic views of Bakoven Bay, the Twelve Apostles and the Atlantic. Plate glass sash windows look down on the intimate Bakoven beach – a sheltered haven for Cape Town’s most selective sun seekers. This ultra luxurious penthouse is a study in sumptuousness and style, with a glistening all-white interior and burnished with touches of silver. Spanning the top floor of a modern architecturally designed beach house, Victorias Secret is situated just across the road from Cape Town’s Premier Beach Destination. Penthouse 2 is located in Bakoven, an easy walk to the famous Camps Bay Beach with its fine restaurants, trendy shops and sidewalk cafes, or a five minute drive to one of Clifton’s four popular beaches.